Along with providing structural support to the cell, and transmitting force signals, cytoskeletal filaments also provide cells with a network of ‘tracks’ that can be followed by specific proteins for the directed delivery of vesicles and their subcellular ‘cargo’. This process is essential in ensuring an adequate concentration of required components is maintained at sites undergoing rapid or modulation, or where a specific subcellular process is being carried out. For example, filopodial extension during cell migration requires numerous components, and occurs rapidly, yet has limited access to the cytoplasm and any soluble components. Cargo that can be delivered or by cytoskeleton-dependent intracellular transport mechanisms can include other proteins and complex components. This delivery process is analogous to a freight train carrying cargo to specific locations, as dictated by the presence of railway tracks. Similar to a freight train, motor proteins capable of carrying cargo also face restrictions in the direction they can travel, the speed at which they travel and the possibility of traffic jams along the route. Specific members of the Myosin superfamily of motor proteins are known to transport cargo along actin filaments. Myosin-V and Myosin-X are two examples. Although the specifics of their movement are distinct, the concept is the same, and can be understood when considering how Myosin-X transports components down the length of a growing filopodia. The transport of components along filopodial shafts is crucial to the continued growth of actin filaments and the formation of adhesions at the tips of filopodia. 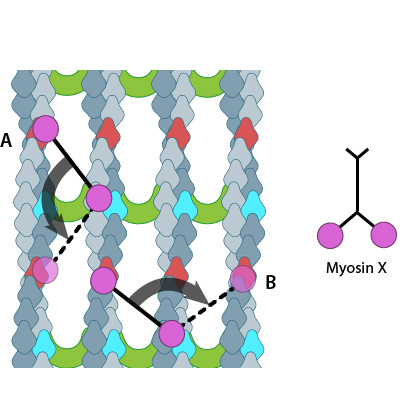 Myosin-X facilitates the transport of components from the cell body to filopodial tips, resulting in their integration into the cell membrane as receptors/adhesions or their use in the growth of actin filaments and filopodia . Movement of myosin-X is driven by ATP hydrolysis, in a unique mechanism that resembles walking or stepping. This movement is known to occur preferentially on actin bundles rather than single actin filaments . Although it is essentially a forward movement, evidence indicates that the protein may also take side-steps. This may be carried out as a means of overcoming obstacles or defects in the track . The walking mechanism of myosin-X is known to be distinct from other walking myosins such as myosin-V;. This is particularly relevant to the step size and the preference for specific actin bundling proteins . Whilst myosin-V takes steps of 36nm and follows single filaments rather than side-stepping along parallel filaments of the bundle, myosin-X takes shorter steps which have been measured at 17.5nm . This shorter stepping distance may explain why myosin-X uses binding sites on parallel filaments, as a short step on a single filament would result in the protein rotating around the natural twist of the filament . Myosin-X is able to carry a variety of cargo to the tips of filopodia . Although the exact mechanism by which myosin-X selects cargo remains unclear it is well established that cargo recognition and binding results from the presence of the myosin tail homology 4 (MyTH4) and ezrin/radixin/moesin (FERM) domains – together these are known as the MyTH4-FERM cassette . A number of components essential to the growth and function of filopodia are carried by myosin-X, including β-integrin . β-integrin is essential for focal adhesion formation and binds to myosin-X via the FERM domain. Knock down of myosin-X by siRNA was shown to disrupt the formation of adhesions to collagen I, particularly at early time points, with no disruption after 60 minutes. This highlights the importance of myosin-X in the initial stages of integrin-mediated adhesion formation . Other cargo transported by myosin-X includes neogenin and ‘deleted in colorectal cancer’ (DCC), which function as netrin receptors. In addition, DCC anchors translational machinery such a ribosomes to the membranes of neuronal growth cones and dendrites . While the myosin family of proteins transport cargo along actin filaments, a different group of proteins utilize microtubules to faciliate a similar process. Here, we consider the kinesin superfamily. The kinesin protein contains a head domain that binds to microtubules, a stalk region where two kinesin monomers interact and dimerize, and a cargo-binding domain that allows the protein to facilitate cytoskeleton-dependent intracellular transport. The kinesin superfamily of proteins represents a large class of motor proteins that carry cargo along microtubules. The kinesin family comprises at least 45 isoforms in humans alone. These proteins are functionally similar to members of the myosin family such as myosin V or myosin-X, which transport material along actin filaments. Microtubules are generally much longer than actin filaments and as such kinesin can transport cargo over significantly longer distances than the myosins . In their inactive state the kinesins exist as monomers, each possessing an N-terminal head (motor region), a neck linker and a globular tail domain. Between the neck linker and tail domain is a long coiled-coil region which serves as a dimerization site that will twist together with the corresponding site of another monomer to produce the active kinesin dimer . Conventional kinesins move along microtubule filaments in a manner that resembles human walking. This has been described as an asymmetric ‘hand-over-hand’ mechanism where one head domain steps forward ~16.2nm whilst the other head remains stationary. The kinesin head domain binds to microtubules. Each step involves a translocation of the trailing head to a binding site 16nm ahead of the previous site. It is then considered the leading head. 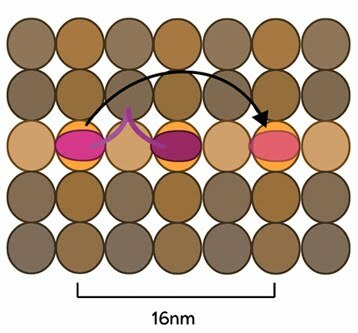 For each step the head domains take, the cargo is moved 8.1nm along the length of the filament  and a single ATP molecule is hydrolyzed. The rate of movement of kinesins is reported to be up to 800nm per second, hydrolyzing approximately 100 ATP molecules per second i.e. 1 ATP molecule per 8.1nm that the cargo is transported . Although microtubules possess up to 13 protofilaments, conventional kinesins walk along single filaments only and avoid binding sites that are theoretically within reach on adjacent protofilaments – binding to these sites would require additional stretching of the neck linker region. In the initial stage of the powerstroke cycle, the neck linker of the leading head is tethered to the head but extended backwards and not interacting with the docking site (A) Following ATP binding and the subsequent conformational change, the neck linker docks with its docking site in the leading head. This pulls the trailing head forward (B). The trailing head continues forward until the neck-linker of the trailing head disengages the docking site. This head finds the next binding site and becomes the leading head (C). The cycle continues, allowing the Kinesin to “walk” down the microtubule filament. Molecular simulations were recently used to describe the kinetics of the kinesin powerstroke cycle. In this study 3 stages were described that determine step size and direction of the kinesin protein. 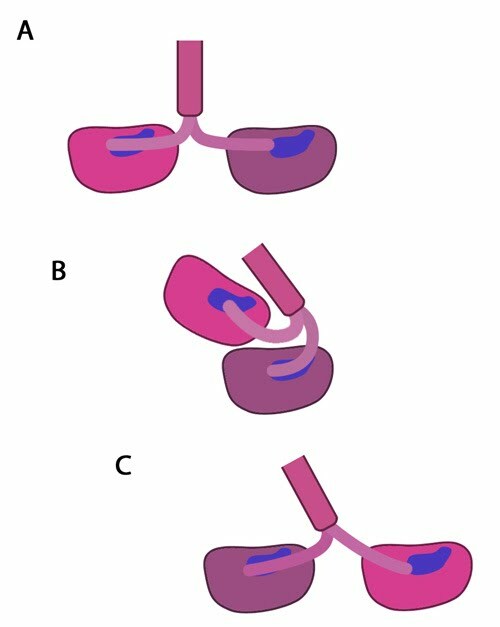 In the first stage the neck linker undergoes a conformational change upon ATP binding in which it ‘docks’ with the leading head . This essentially involves the alignment and binding of a large portion of the neck linker with particular residues on the leading head. 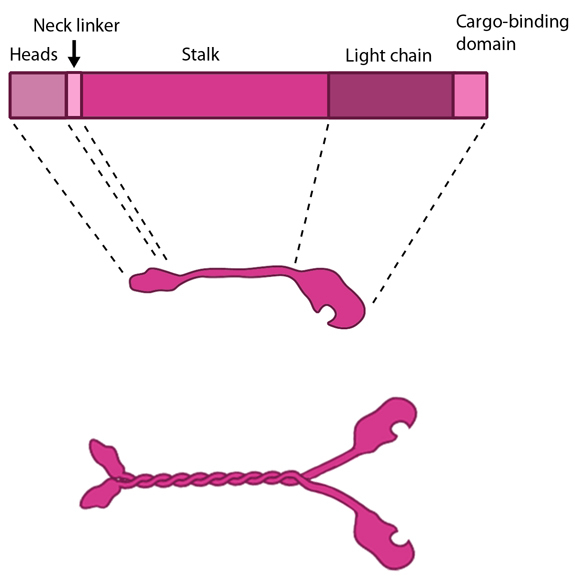 In a starting position where the two heads of kinesin (trailing and leading) are bound to a microtubule, the neck linker that is tethered to the leading head is extended backwards and so does not interact with the docking site on the leading head . Upon commencement of the step process, ‘docking’ occurs which alters the flexibility of the linker region to ensure movement of the trailing head follows along the same line and direction as the leading head . The importance of the neck linker in the kinesin powerstroke has been highlighted by studies that inhibited, removed or replaced this region and reported a range of consequences, from a disruption of the step size to complete inhibition of the walking mechanism  . Linker docking could also be said to regulate the second stage of the step in which the trailing head moves forward by ‘tethered diffusion’. In this second stage the trailing head, which is now bound to ADP, will cover the majority of the 16nm long distance to the next binding site. This occurs via anisotropic translational motion (i.e. in a specific direction along the microtubule) and with isotropic rotational motion (i.e. with a uniform rotation). In this stage the trailing head searches for the optimal binding site. During stage 3 interactions between the trailing head and the microtubule binding site occur . Upon binding, ADP diffuses from the nucleotide binding site of the trailing head and the neck linker relaxes away from the docking site. Another ATP molecule will now bind to the leading head and the powerstroke cycle will continue to repeat. Approximately 6pN of force is generated by a single powerstroke of kinesin .